The world’s first inflatable windbreak. Simply peg and pump, never has a windbreak been easier to set-up! 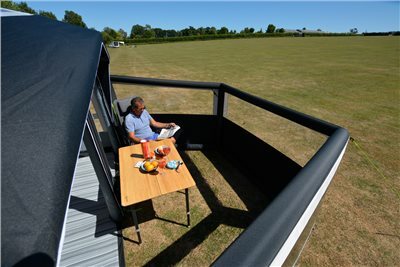 The AIR Break can be used free-standing or connected to the front of our awnings to create a fully enclosed area – great for keeping dogs in! Utilising our unique AirFrame system with single point inflation, the AIR Break is surprisingly sturdy in the wind and it’s striking colour combination and use of WeathershieldTM Pro material make it a great match for our AIR Pro awnings. A window panel runs throughout the windbreak allowing visibility out.